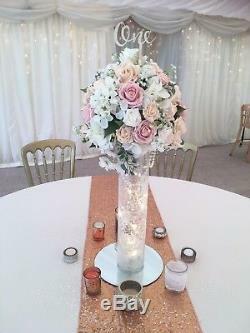 Blush, Ivory And Champagne Wedding Table Flowers Centrepiece - Including roses and gypsophila with foliage. This posy style arrangement is presented on a tall cylinder crackle glass vase. Please note table numbers and lights are not included. 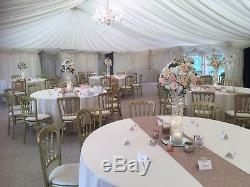 These arrangements are also available to hire for a fraction of the cost. (Local service or collect only) Please get in touch for more information. (As these are all made to order Flowers may slightly vary from image shown). The current lead time for these is 3 weeks so please take this into account before ordering. If you would like this arrangement in different colours please get in touch to use our bespoke service. We have matching long low top table arrangement is also available. We only use the best quality silk, foam and artificial flowers making sure our flowers look as realistic as possible. All items are handmade to order by me. I'm a fully qualified professional florist with 17 years experience. If you need your flowers sooner than the date specified please get in touch. The item "Blush, Ivory And Champagne Wedding Centrepiece Table Flowers Arrangement Tall" is in sale since Saturday, March 17, 2018. This item is in the category "Home, Furniture & DIY\Wedding Supplies\Flowers, Petals & Garlands". The seller is "field_of_dreams" and is located in Braintree. This item can be shipped to United Kingdom, Antigua and barbuda, Austria, Belgium, Bulgaria, Croatia, Cyprus, Czech republic, Denmark, Estonia, Finland, France, Germany, Greece, Hungary, Ireland, Italy, Latvia, Lithuania, Luxembourg, Malta, Netherlands, Poland, Portugal, Romania, Slovakia, Slovenia, Spain, Sweden, Australia, United States, Canada, Brazil, Japan, New Zealand, China, Israel, Hong Kong, Norway, Indonesia, Malaysia, Mexico, Singapore, South Korea, Switzerland, Taiwan, Thailand, Bangladesh, Belize, Bermuda, Bolivia, Barbados, Brunei darussalam, Cayman islands, Dominica, Ecuador, Egypt, Guernsey, Gibraltar, Guadeloupe, Grenada, French guiana, Iceland, Jersey, Jordan, Cambodia, Saint kitts and nevis, Saint lucia, Liechtenstein, Sri lanka, Macao, Monaco, Maldives, Montserrat, Martinique, Nicaragua, Oman, Pakistan, Peru, Paraguay, Reunion, Turks and caicos islands, Aruba, Saudi arabia, South africa, United arab emirates, Ukraine, Chile.